The first is Brute by the musician Fatima Al Quadri. She was involved in the Occupy Wall Street movement, she witnessed both the optimism of the protestors and the brutality of the police. This is an album shaped by Occupy and the events around Ferguson. 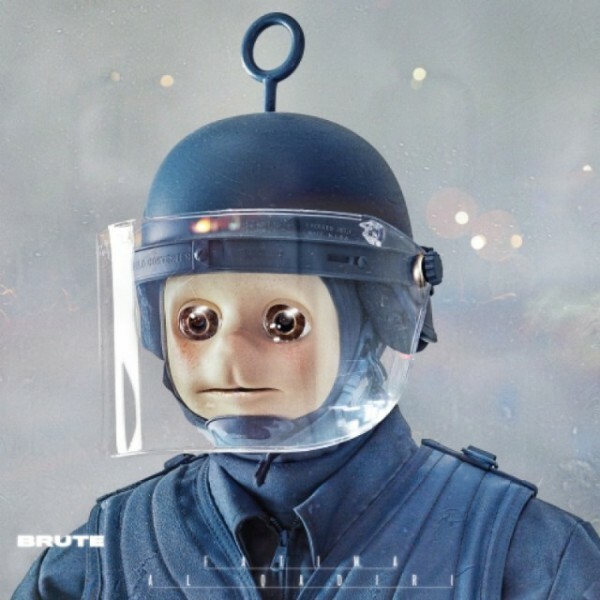 Her album Brute is series of electronic/grime songs capturing those dark days. The second is by the jazz musician Charles Lloyd. He has recorded some great traditional tunes and also returned to some of his old songs. Many are against war and injustice. His vision is less dark, more optimistic and the music is memorising. If you haven’t already discovered these albums I hope you will. I have also reviewed three other albums/tracks that have had a big impact on me. Brute begins with a recording of a police unit talking over a radio. The only other sound is the slow beat of a taiko drum (taiko drums are used on demonstrations of the social movements in Japan). Over a loudspeaker the police call on a crowd to disperse. Suddenly a LRAD, a sound weapon that beams concentrated blasts of piercing noise, lets forth its sonic rage. What follows is the sound of tear gas being fired, protestors screaming and rampaging police. The opening track is called Endzone it is like no other electronic track I’ve ever heard and it sets up the listener up for what is to come. The composer and musician Fatima Al Qadiri was born in Dakar, Senegal, and lived in Kuwait for most of her childhood, now she is based in New York. Brute was written while Fatima was convalescing from an injury and watching the events of Ferguson unfold. The album’s cover is a picture from the artists Josh Kline’s piece Freedom. It depicts a Teletubbie (I think its Po) in SWAT gear. Kline’s Freedom installation depicts four towering ‘Police Teletubbies’ dressed in SWAT gear guarding a space modelled after Zuccotti Park, the privately owned public space in New York City and site of the Occupy Wall Street protest camp in 2011. In one interview Fatima said the idea of Brute was to get across “atmospheres of rage and despair”. And that is exactly what this concept album does. Only three tracks use speeches, the rest of the album is made up of haunting electronic melodies, samples of glass smashing, police sirens wailing and choral cascades create a landscape of police terror, state violence and protest. This album is a cross between the Japanese musical theatre sound of J A Seazer and the film score to Blade Runner. Tracks such as Oubliette (a French word for medieval dungeon and torture chamber) and Curfew convey a sense of claustrophobia and paranoia. Likewise 10-34 (the US police radio code for a riot) and Blows, openly side with those rebelling. On Blows the track begins with a reporter saying, “the troublemakers were carrying pepper spray and guns and were wearing badges”. And on the album’s closing track Power, Fatima inserts an interview with ex-LAPD sergeant Cheryl Dorsey on the abuse of police power into the middle of a sonic landscape. Brute has not got good reviews; RA and the Guardian have accused it of being too dark and political. Pitchfork said it didn’t’ offer a solution to the problems she raised. Since when has music had to offer solutions to the problems of the world? If that were the case Marvin’s What’s Going On would be a turkey. Electronic music is often and rightly accused of failing to talk about political issues. Well here is a musician who has produced an album that exposes police brutality and is clearly on the side of those who say “Black lives matter”. The music is dark, bleak and brutal – just like the US. On the album I Long to See You, Lloyd has assembled a stellar band – Bill Frisell on guitar, Greg Leisz on pedal-steel guitar, Reuben Rogers on electric bass, Eric Harland on drums and guest vocal appearances by Norah Jones and Willie Nelson. But this is no straight ahead jazz album, like Bob Dylan last year, Lloyd has returned to the great American songbook and recorded an album of achingly beautiful songs. The album opens with a Coltranesque version of Bob Dylan’s powerful anti war song Masters of War. But from then onwards it takes a different musical path – utilising blues, folk, country and jazz. Lloyd and the band reinterpret a number of traditional songs and some of his own compositions. One of the standout tracks on the album is the famous folk song Shenandoah. The great musicologist Alan Lomax argued that Shenandoah was a sea-shanty sung by French seafarers who brought it to the US. The Library of Congress suggests that the song is of Native American origin and tells the story of daughter of the Indian Chief Shenandoah, who is courted for seven years by a white Missouri river trader. Whatever the origins Lloyd, like Charlie Haden before him, has turned this simple folk song into a grand musical statement. Lloyd and the band return with another anti-war song Last Night I had the Strangest Dream. This classic folk song has been given the Country treatment by the singer Willie Nelson and Greg Leisz’s steel guitar playing is just sublime. Who’d have thought it possible – jazz meets Country! Running in at just 1 minute 22 seconds is the hymn Abide With Me, it may be short but it will stay with you for a long time. In Britain it may be better known as a rugby song – but in the US Civil rights marchers sang this hymn in the 1950s and early 1960s. Norah Jones also puts in a great vocal appearance on the soul classic You are so beautiful. But in my opinion the best track is saved for last, a Charles Lloyd composition titled Barche Lamsel. Lloyd has been creating great music since 1959, this winding haunting meditation is up there with his best work. Day Without Yesterday’ begins with filtered down congas, a strong kick drum and some steady shakers to create the backbone of this Detroit-style House jam. Once the groove is established Peggy brings in a cool bass-line that’s reminiscent of old school Rick Wade cuts and tops it all off with some sparse keys and crisp high hats. ‘Six O Six’ on the flip hears Peggy entering into more acidic territory filled with modular mutation and driving percussion. Peggy also shows off her vocal talents as she gives the listener a counting lesson in her native Korean tongue over the fine analogue house production. Moscow born Nina Kraviz is fast becoming a DJ legend. Her Deep House sound often blends into ambient even pop tones. Each track blends stark, minimalist beats with haunting, sultry vocals and samples. This isn’t music for the big arena; it’s for dark rooms with a single strobe or for walking in the city at 6am. When this album first came out in 2012 it became an instant classic. Luckily for those who missed it has been reissued. My curve ball this month, and it’s is not really a curve ball is in fact Honeymoon by Lana Del Rey. I don’t buy many “pop” records, but ever since I heard her album Born to Die I have become fascinated by her records. Her latest is the deepest one so far. These aren’t your average pop songs, she explores recurrent themes of destruction, the American dream, wealth, fame and the frailties of the human condition. Musically she is the queen of retro. Her sound is “big” something akin to the cinematic, film noir soundscapes of the late 1950s and early 1960s with a modern twist. Lots of people laugh at me when I say I like Lana Del Rey – but they are usually people who have never listened to her music. If these songs were written and performed by Johnny Cash or Frank Sinatra people would say they were the work of a genius. If you have kids borrow their copies of the Lana’s records or alternatively download them – it’s all the rage nowadays. Another very interesting collection. The Charles Lloyd album is my favourite. Charles has very much followed his own road over the years. Always liked him. Thanks for your comments. I agree Charles Lloyd has always produced great music, but his work on ECM and now Blue Note is of exceptional quality.